This post will guide you through the whole process from getting started with your IndoorAtlas account. We’ll look into setting up your venue on indoorAtlas, and finally connecting to your IndoorAtlas venue using Proximi.io Web Portal. We also recommend you to check out the previous articles in this tutorial series to get all the basic things done before getting your hands on geomagnetic positioning. Go to http://indooratlas.com , and create an account. Create a location in Dashboard. Select “Locations” from the left side bar and from the top right corner, choose “Create location”. Type in the name and the address of the location in the available fields. If the system doesn’t find your street, try with the city or province and zoom in to the correct location. After finding the address, the system will automatically suggest you the latitude and longitude of the location. If not, please type them manually. Click the blue “Submit”-button. Add a floor to your location. You can do that by clicking “Add new floor plan” in the Location Overview. Name your floor plan, type in the floor number and upload a picture of it in PNG or JPEG format. Align it to correspond to its real-life coordinates and make sure that your floorplan is as detailed and true to life as possible. You can move and stretch the floorplan by dragging from the three corner pointers. By holding down ALT button while dragging, you can move the pointers to another point on the floorplan. When you are ready, please click “Submit”. Step 2. Create a new app and start mapping! Click “Apps” on the left side bar. Indoor Atlas provides you a default application called “MapCretor”. If you want to use the default app, please click it. Click on the Api Key field, and it will show you the Api key id and API key secret strings. You will need this information later. You can also create your own application instead of using the default one. In order to do so, please choose “Create new Application” on the top right corner in MyApps page. Name the application and click “Submit”. Add a new API key by clicking “Add new API key” button on the top right corner. Name the API key and click “Submit”. After you have figured out your API key id and API key secret, please start mapping the location. 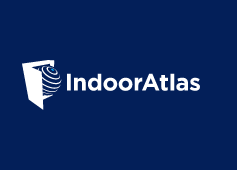 In order to do so, please download the IndoorAtlas MapCreator 2 app. You’ll be using that for recording the fingerprints of your location. Note that the recording is best to do with an Android device, as you will then be able to utilise Wi-Fi signals as well. Login to the app with your IndoorAtlas account information, and select the floor you just created. You need to calibrate your device before the mapping. Once you are done with mapping the location, login to Proximi.io. Now you need to connect Indoor Atlas and Proximi.io accounts. Go to “Manage Places” and add your IndoorAtlas Location ID to your place information. It is the Location ID from IndoorAtlas. Go to “Manage Floors” and add the Floorplan ID for each of the floors. Go to “Manage Applications” and enable IndoorAtlas for your application. 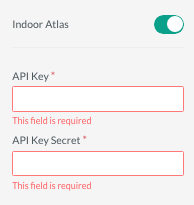 You will then be required to type in your API key id to the “API Key” field, and your API key secret to the “API Key Secret” field.’ If you are not sure where to find them, please check the step 2. Now you are ready to move to the next step.